The use of nonsense words in intervention programs for reading and spelling to struggling readers is ubiquitous. It is ubiquitous in assessments too. Publishers use the rationale that nonsense words help the teacher and assessor know whether or not the student is able to transfer what they have learned about decoding to new words and this signals progress. The problem with this is twofold. First, many of the nonsense words that are used are not possible letter strings in the English language. (For a detailed and well-support description of this, please read Gina Cooke’s article). Secondly, the English writing system is based on meaning before phonology, so when a student is reading a word with no meaning, it can be impossible to really determine what the correct pronunciation is. In teacher trainings, we always ask the group, how do you pronounce the letter string *<chom>? The answer we always get is /chom/ or [ʧɑm] in IPA. The problem with this answer, is that the correct answer is really, we can’t know what the correct pronunciation is until we know what the word is. In the case of a digraph like <ch> the meaning and etymology of the word will drive the pronunciation. Look at the following three common words: chip, machine and ache. Their histories drive their pronunciations, so how in the world can a student know which is correct? Do you see the conundrum with the starred words? The words were being dictated by the teacher with no context. There was no conversation about what they meant. There was no conversation about their etymology. They were spelling based on phonology first. Yes, they were working on the what how to spell words with a long and a short vowel. However, when the students spelled *bating, *boting and *hiped they were praised for being correct. What are they going to do when they spell boating as boting and baiting as bating and hyped as hiped? Without context we cannot spell, period. This entry was posted in Orthography on March 31, 2017 by Dr. Kelli Sandman-Hurley. THANK YOU! I’ve been wanting to see the nonsense-word craze stop! Perhaps, with your influence, it will. In addition to the confusion posed by invented pseudowords, they are unnecessary. If one wants to check spelling for students who have a ready bank of sight words and a tendency to “guess” words, I use words that are beyond the vocabulary of the student such as “camshaft”. I also use somewhat less common Anglo-Saxon words and Irish, Scottish, or Aussie words such as “swagging” or “birl”( spin) that are not commonly used in the US. If at all possible I strive not to squander their considerable efforts in decoding. I don’t use nonsense words in my teaching and am always made to feel guilty about it. This gives me great backing! I wonder the literature on showing children the orthography above on visual / orthographic confusion? I find it hard enough to teach the /ed/ suffix in place of overused phonetic spelling (‘t’ for hopped), without presenting words spelled that way. For a kid who can read whole words in connected paragraphs/stories, but can’t read standalone, unknown multisyllable words, nonsense words help them understand how words go together and come apart. It breaks the reading process down one step further than most people need. Thanks for this. So many screeners and academic achievement tests have non-sense word decoding as a section or subtest. If a student bombs this portion of the of the test, but scores average in the real word areas, what are we to make of the scores, in terms of intervention and goals? I agree wholeheartedly with Paola’s comment about “not squandering their considerable efforts in decoding”! 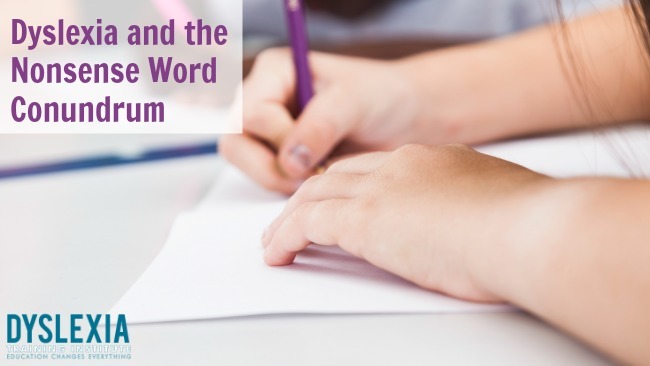 As a dyslexia teacher and assessor, I also dislike giving non-word reading tests when assessing, with the premise that it helps to assess knowledge of decoding and spelling patterns. There are plenty of more unusual or challenging regular and irregular words in the English language which could surely be included in standardised tests to help identify these skills? But those * words are real words. So I’m slightly baffled by these examples. If the expectation is that the student apply only certain rules they’ve learned and they are being asked to spell actual words wrong – those are hardly nonsense words. Boating hyped, baiting. Those are poorly chosen. It’s not the same as asking a child early on to decode stropt or bampt or something. Or even multi-syllable words that can’t be confused with real words. Although I’m appreciative of approaching spelling with meaning – I’m not getting the throw the baby out with the bath water approach. Totally disagree with you on this one. Bright kids like mine use context and memorization to avoid decoding and nonsense words are what forced them to do it. Absolutely no science to back up your opinion. And already, teachers commenting want to throw out nonsense word testing, which is scientifically validated whereas this opinion is not. People are starting to listen to you. Don’t discredit the Most effective methods available in the field just because one person had a poorly worded curriculum with real words masquerading as nonsense. Christina: Studying words out of context and without meaning attached to them is not teaching how English actually works. Readers often look for orthographic neighbors when reading, and when they read nonsense words their word retrieval is slowed down because they are searching for similar letter strings and for meaning. I have included a small portion chart of miscues that I have collected from completed TOWRE-2 assessments to illustrate my point. As far as science to back my opinion goes, one only has to do a cursory search in the linguistics research, which is way more ‘sciency’ than educational research, to find this information. Once the education community starts to understand the linguistics community we can have a more informed conversation. I have put my money where my mouth is and done just that. 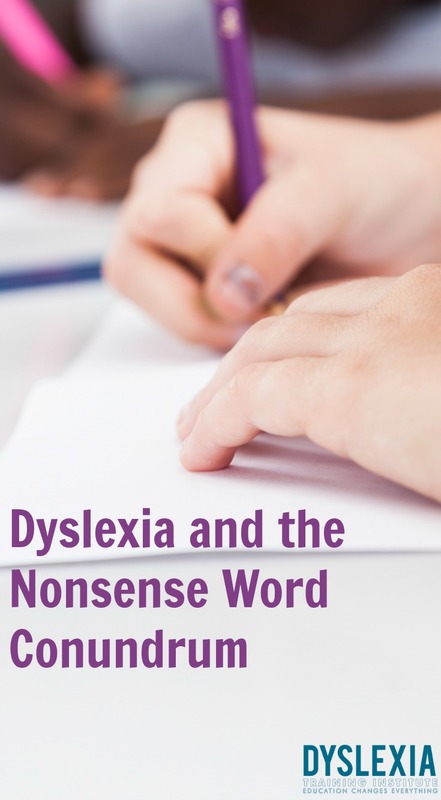 Having said all of that, I do understand that one piece of dyslexia identification can be their difficulty reading nonsense words, but that does not mean it should be used as an instructional technique. I highly recommend you look into psycholinguistics for more information. Below is my informal data collection and analysis. I do not base my writing on just my opinion alone, I study how language works.